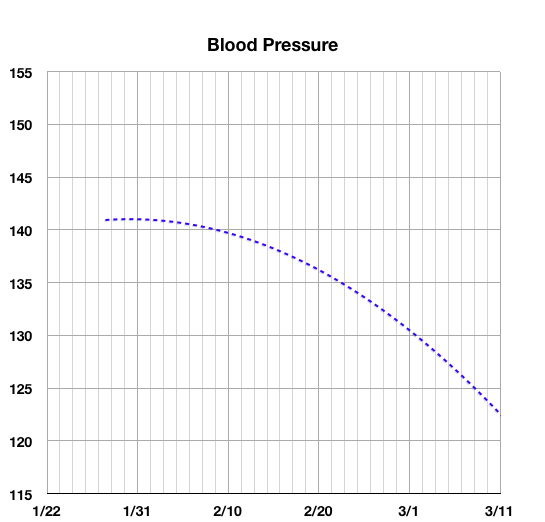 This graph of the least-squares average of blood pressure readings over an almost two-month period shows a reduction from 141 to 123 in systolic blood pressure of one student in the University of the Heart, Class of 2012, who practiced Heart Rhythm Meditation daily. Slowing the breathing rate has been shown to reduce blood pressure. Within a few minutes, the muscles surrounding the small blood vessels dilate [relax], allowing blood to flow more freely, resulting in lower blood pressure. The research cited below shows that with a breath rate of 10 breaths per minute, blood pressure is reduced up to 36 points systolic and 20 points diastolic. Average reductions in seven clinical tests were 14/9 points. Heart Rhythm Meditation lowers the breathing rate even farther to 5 breaths per minute. Advanced practitioners reach 3 breaths per minute. We have found that the average person can easily learn to reduce their breath rate to 5 breaths per minute, without the use of any monitors or instruments, through Heart Rhythm Meditation. Five breaths per minute is accomplished with a six-second inhale and a six-second exhale. These studies are cited by the makers of "Resperate", an electronic device that guides one into rhythmic breathing. Heart Rhythm Meditation also creates rhythmic breathing, at an even slower rate, without an instrument, by feeling the pulse or heartbeat. Parati G, Izzo JL Jr, Gavish B., in Hypertension Primer, Third Edition. JL Izzo and HR Black, Eds. Baltimore, Lippincott, Williams, and Wilkins, 2003; Ch. A40, p117-120. Treating hypertension with a device that slows and regularizes breathing: a randomised, double-blind controlled study. Schein M., Gavish B., Herz M., Rosner-Kahana D., Naveh P., Knishkowy B., Zlotnikov E., Ben-Zvi N., Melmed R.N., Journal of Human Hypertension 2001; 15:271-278. Grossman E., Grossman A., Schein M.H., Zimlichman R., Gavish B. Journal of Human Hypertension 2001; 15:263-269. Rosenthal T., Alter A., Peleg E., Gavish B., American Journal of Hypertension 2001; 14:74-76. Reuven Viskoper , Irena Shapira, Rita Priluck, Rina Mindlin, Larissa Chornia, Anny Laszt, Dror Dicker, Benjamin Gavish, Ariela Alter, American Journal of Hypertension 2003; Vol 16:484-487. Are breathing exercises an active component in reducing high blood pressure? A retrospective view. Repeated blood pressure measurements may probe directly an arterial property. The pressure dependence of arterial compliance: a model interpretation. Self-monitored home blood pressure using automated data-logging devices and a web-based reporting system: A clinically valuable tool. Hypertension reduction by device-guided breathing shows a dose response relationship. Acute effects of device guided-breathing on cardiovascular parameters and baroflex sensitivity in normal subjects.